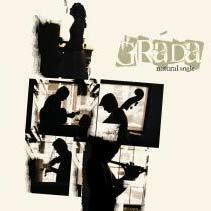 From the Better Late Than Never Dept: Here’s a post on Grada’s latest release Natural Angle. I hate it when I’m rummaging through some random pile of desktop detritus and find a CD I should have reviewed a year ago. That’s what happened with Natural Angle, which came out early in 2010. It’s so good I can’t let it pass. Based in Ireland, where they began playing together in 2001, Grada mixes traditional Celtic and Appalachian tunes and songs with contemporary pop and Americana songwriting. Produced by Tim O’Brien in Nashville and featuring guest appearances by Odessa Jorgensen (Bearfoot) and banjo queen Alison Brown, as well as O’Brien, Natural Angle reflects the worldwide roots of Grada’s members, which include Canada and New Zealand, as well as Ireland. If you’re familiar with the sound of supergroup Lunasa, you will hear a similar approach in their smooth and intense tune sets, which are layered upon a foundation of double bass. Vocalist Nicola Joyce shows remarkable range and brings to mind the stage presence of Dervish’s Cathy Jordan, who also plays bodhran. Natural Angle solidifies Grada’s stature as one of the great Irish folk ensembles. Fiddlefreak recommended! Nice post, Stuart! I’d forgotten about this album. But I didn’t forget about their SICK rendition of Pretty Polly. Their instrumental break in that song absolutely slays me. I’ve got it spinning now, thanks! Very Cool! I just made this documentary on a bluegrass one man band street performer. Thought it might be worth posting.